I really think my body's starting to ask for healthier food on its own. Why? Well, after making an amazing Zucchini Bread, I realized that I had a bunch of left over zucchini. My mom said she wasn't going to use it, and my sweet tooth definitely started to act up, along with I guess my healthy tooth. 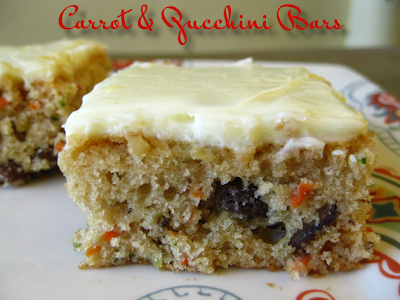 I rummaged through my baking books, and decided on making these Carrot & Zucchini Bars from The Ultimate Cookie Book. It sounded healthy and yummy at the same time. The authors of TUCB even agree: "What a delicious way to get your family to eat their veggies! No one will suspect the healthful ingredients these heavenly, moist bars contain." 1) Preheat oven to 350F. In a large bowl, stir together flour, baking powder, ginger, and baking soda. In another large bowl stir together eggs, carrot, zucchini, brown sugar, raisins, walnuts, oil, honey, and vanilla. Add carrot mixture to flour mixture; stir just until combined. Spread batter evenly in an ungreased 13x9x2-inch baking pan. 2) Bake about 25 minutes or until a wooden toothpick inserted in the center comes out clean. Cool in pan on a wire rack. Spread cooled bars with Citrus-Cream Cheese Frosting. Cut into bars. In a mixing bowl beat one 8-ounce package softened cream cheese and 1 cup powdered sugar with an electric mixer on medium speed until fluffy. Stir in 1 teaspoon finely shredded lemon peel.